I have met many different tea friends over the past few years, many of which have completed the George Brown Program. The amount of tea, the kettle one uses, quality of tea and “devices”. These are things that one should learn over time, I have found that in one gaiwan, I just need to cover the bottom for a rolled Oolong. While for another I need to fill it just that little bit more because of the shape. As for kettles, I first used a plastic Betty Crocker I was gifted at the start of my Journey. I have mentioned this off hand to a few people, friends and customers at work, only to receive the same reaction. Many people see plastic as “taboo”, but in my case this particular kettle is of sentimental value. This in itself added to my tea. On the other hand I was looking for a kettle made of a different material, partly from peer pressure and partly from the desire to have different elements ( think fire, water etc) in my tea sessions. Quality of tea is another thing that one must learn. The first teas that I purchased were from the Chinatown supermarket. I used to have a Toucha Pu-er from back then, it only cost me $2.99CND. This tea has a fuller body than some other pu-er I have tried before the ones I am trying now. Pu-er in general is a learning experience in itself as there is a vast array of types, regions, leaf size etc. Devices and tea ware vary from person to person. When I was an employee at Teaopia and Teavana, I became accustomed to the “Tea Master”, made of …plastic. Customers buy them all the time, I have even used them on occasion when I have no other method to brew. The end result is the about the same. In contrast to this device I use gaiwans at home, a much more enjoyable method to brew tea. It took me a long time to get to the point of even purchasing one as the amount it could brew at once was small. Canada and America are used to large mugs, large tea pots that are filled with many many tea bags. My first cup of tea was from a tea bag as a child in a tea pot that held 10 cups of tea which equaled to only 5-6 with our mugs. While working for both companies I helped them find the teapot that matched how they were comfortable making tea. Which is the way that meant the most to them, usually developed by tradition. What I am trying to say is when we learn things in such a setting as a class or school. There is a need to take a step back from what we have learned and allow the leaf to speak for itself. Make some “mistakes” in the amount of tea or temperature of water you use. Relax and see what happens. This is the best way to learn and continue to learn from the leaf. 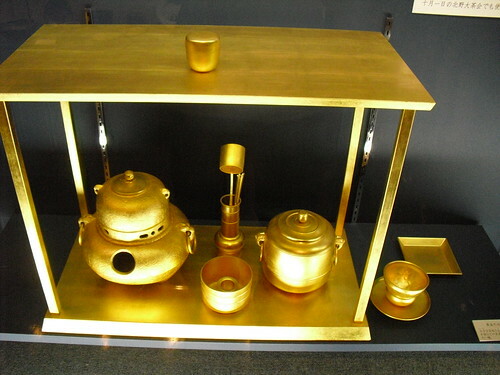 If tea called for a gold tea room, would you seek out to get one?